Holyrood council welcomed the chairman and members of its 50th Anniversary Come Home Year Committee to the council chamber last week for a formal introduction. Afterwards, Mayor Gary Goobie pressed the Town’s seal on a proclamation announcing the event. 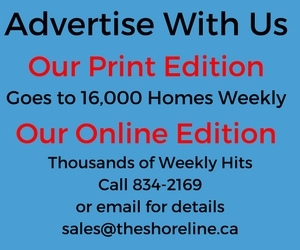 “On behalf of council I want to thank you so much for stepping forward, getting involved and being part of this committee, which will certainly see us have a very exciting and memorable and historical year here in the community,” Goobie told the committee members who are headed by former councillor Gus Hawco. 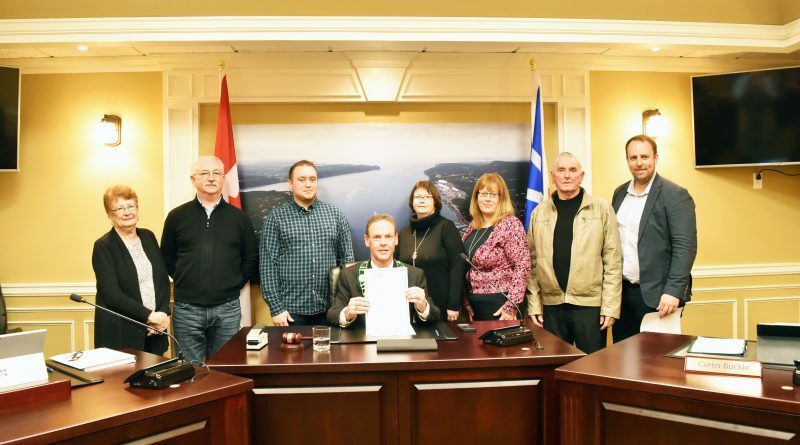 In the proclamation, Goobie noted that Holyrood, which sits at the head of Conception Bay, has a long maritime history dating back to its settlement in 1689. The community became important as a source of bait for the fishing fleets working on the Grand Banks. Goobie said the economy of the area changed in the 1880s with the arrival of the Newfoundland Railway. Holyrood is also the site of a number of firsts, Goobie added, including being the site of the first cold storage facility for the fisheries in 1932, the home of Newfoundland’s first and only rubber plant, in 1954, and Atlantic Canada’s first refinery, in 1961. The first moves toward self-government came in 1962 with the appointment of the Holyrood Local Improvement Trustee board. A second board was appointed four years later. Those were the precursors to municipal incorporation in 1969. Councillor Ghaney said a number of Come Home Year events will be launched during the Crystal Carnival. “If hard work has anything to do with it, it’s going to be a great year,” she said, thanking the organizers.